There are so many varieties of exersaucers, the task of finding the perfect one can become a little daunting. We're here to help you out! We scoured the reviews, read up on recalls, asked over a dozen moms, conducted hands-on reviews, and compiled all the information here in our list of the best baby exersaucers and activity centers of 2019. Below we list the top 5 baby exersaucers, followed by in-depth reviews of about nearly a dozen different options. These ratings and reviews are for 2019 and include many of the new and popular activity centers that have recently hit the market. If you are looking for an exersaucer with wheels, check out our reviews of baby walkers. Here are the Best Exersaucers of 2019! About $75, and a #1 best-selling activity center. This activity center is very similar to the Baby Einstein one (below). Like that unit, this activity center adds a "jumper" with elastic supports that provide a fun jumping/bouncing experience for your baby. Parents report that it's much bouncier, more so than the Baby Einstein, so your baby can go a bit "wild" jumping around. The lights/sounds are triggered by the bouncing or through hand contact, with zoo animal sounds that you can adjust the volume for. Note there is also a Luv u Zoo version of this jumperoo. The seat independently rotates 360-degrees to reach everything, it has a built-in teether toy and a tray for snacks, and parents report that it is very sturdy and well-constructed, and a bit lighter weight than some of the other units. Also, when things happen (and they always do! ), like a ripped seat, Fisher-Price is super responsive to warranty repairs or replacements. Limitations? Some parents report that their baby is not tall enough to reach the floor, even on the lowest setting; this is also a reported issue for the Bright Starts model (#5 below). We tested it with a 7-month old baby who is 60th percentile for height, and he was able to reach the floor just fine. And others report that the hanging hippo and monkey are out of most babies' reach, and can be frustrating for your baby when they want them but can't quite reach. Overall, a great jumper activity center, worthy of its spot at the top of our list! Note that Evenflo makes a very similar jumper for a little more money, that we also really liked (below). Interested? You can check out this Fisher Price Exersaucer here. 2. 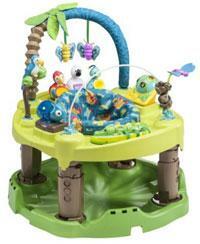 Skip Hop Explore & More Activity Center. About $100. Skip Hop makes high quality, simple, durable, and stylish products that are nice to look at and practical to use. 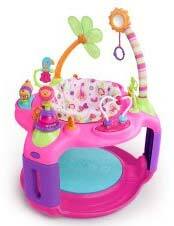 This exersaucer and activity center is no exception. 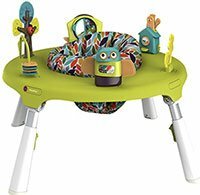 It features a comfortable rotating seat, an adjustable-height foot platform, and an adorable array of colorful and functional toys. The cool thing about that foot platform is that it can be adjusted up and down to suit your baby's height, so you won't run into the issue of your baby bouncing around freely with their feet not reaching the floor. And down on that platform is a little foot-operated keyboard that, if your baby steps on it, will light up and play some tunes. A little discovery window is positioned above it so baby can look down and see what they're up to; the keyboard can also be removed from the foot tray and placed right onto the discovery window for use with hands. The toys were great for a few reasons: we loved that they were relatively simple, with bright primary colors, and fun spinning, flipping, and popping with some nice multisensory feedback without overloading them with a ton of crazy toys. The toys also use a clever clip-on/off mechanism so you can remove them for washing and then just clip them back on wherever you'd like to position them. And it's really versatile. It starts off as an activity center for seated play, then can be used for cruising by removing the foot platform and using it to cover the seat, and then as a table for toddlers. So there are a lot of great things here. In our testing, we really loved this activity center, and didn't find any major gripes with its functionality. It doesn't fold up, but it was just a couple minutes to pull the legs off for easy storage. The only thing that would be nice is to maybe make the foot platform a bit spring-loaded so baby can bounce a bit more. 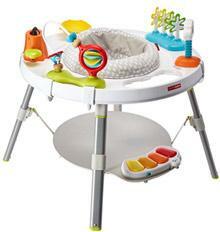 Overall though, this is an excellent and versatile activity center that your baby is sure to love! Interested? You can check out this Skip Hop Exersaucer here. 3. Oribel PortaPlay 4-in-1 Activity Center. About $125. This is yet another exciting new addition to our list, with great versatility (4in1), high quality, flexibility, and durability. We tested this activity center for the first time this year and were really impressed with it! We loved the modern styling, simplicity, and the features that help out both baby and parents alike. Let's start with the features. First, this 4-in-1 exersaucer can be used in 4 ways: first, you can quickly fold up its legs for easy storage, and in this configuration, we were able to slide it right under our bed after popping off the toys. Second, you can use it as the activity center itself, by snapping the toys onto the top and unfolding the legs. This was definitely the best part! You can adjust the leg height about 5" up and down, which means that you can get it as low as about 13" from table top to floor, and as high as about 18" from top to floor. That adjustable height is key for making sure this can be used across a wide range of baby heights (and leg lengths!). The toys are simple but fun, and they use a cool pop-on/off design that lets you swap them into different positions; for example, you can put 2 toys on for a week, then swap out 2 different ones to keep baby's attention. The seat spins around 360-degrees, and we found it to be very sturdy on both hardwood and carpeting. The seat itself seems to have a little bit of elastic to it, which means that baby can bounce up and down a bit for entertainment. Then, once your toddler is walking, you can remove the seat and toys and put a cover on the seat-hole to turn it into a play table. This table can be used as a stand-and-play table, or you can purchase separate chairs to use it as a sit-and-play table. They also sell a cool art paper roll dispenser separately as well, which we liked (but more on that later). So there are a lot of great features here. What it doesn't have are any toys that require batteries or that make lights and noise - we prefer this type of exersaucer ourselves, but we'll leave that up to you to decide what you'd like for your baby. Downfalls? Not many! One thing to mention is that when it's used as a table, it does have the grooves in it from where the seat was and where the toys were, which means that it's not an entirely smooth surface for coloring and art. In fact, those grooves were pretty good at collecting crumbs! And relative to the Skip Hop activity center, we thought it wasn't *quite* as entertaining. Overall, this is an excellent exersaucer made by a great company with a growing reputation for safety and reliability. Highly recommended! Interested? You can check out this Oribel PortaPlay here. 4. Evenflo Jump and Learn Exersaucer. About $80. This is a great new addition to our best activity center and exersaucer list, and we finally got our hands on it for testing earlier this year. Evenflo has a few varieties of exersaucer, they have the Fun, Double Fun, and Triple Fun (see below) versions, with the exersaucers getting increasingly busy and wild as you increase in the "fun" level. For those looking for something a little simpler with less sensory stimulation for their baby, this is one of Evenflo's newer and best options. There are a lot of great features here: the seat rotates around 360-degrees to give your baby access to all of the activities, the activities are simple and high quality including good cause-effect relationships and sensory feedback (we loved the elephant noise! ), and some toys can be removed and taken with your baby. It also has an awesome height adjustment with 3 different levels; with smaller babies, you can use the lowest setting which lets the seat sit down lower to the floor, and then as your baby's legs grow you can use the higher settings to accommodate the change. Height is a big challenge with most exersaucers, and this is a great feature. The seat fabric is removable and machine washable, and the fabric is soft yet durable enough to withstand some serious bouncing! In our testing, we did find that the seat opening was a bit too large for smaller babies around 4 months of age, and we had to use a folded blanket up front to support the torso a bit better. There also is no lock-out to prevent bouncing if you want some calmer play, though we did realize that you can put the seat on the highest height setting and prevent baby's feet from touching the floor (and preventing any big bounces). There are some drawbacks to the removable toys: when the toys get pulled off, they can get lost or dirty, or chewed up by your pet! So some parents might find that feature a nuisance. Others, however, like this feature because it makes it much more convenient for cleaning the parts their baby chews on. Also, it uses six AAA batteries to power its sounds and music, though you can always just run them dead and leave them if you want some serenity from the repetitive tunes! Overall, this is an excellent option for a relatively sleek and simple exersaucers with some great features. Interested? You can check out this Evenflo Exersaucer here. 5. Baby Einstein Activity Jumper. About $90. This activity center adds a fun "jumper" with elastic supports that provide a fun jumping/bouncing experience for your baby. Parents report that babies really like how it has about a dozen different activities on it, that babies can spin around 360-degrees to reach all the different toy stations, and that it has a fun piano. It also has extra loops where you can attach additional toys - like your baby's favorite rattle or stuffed animal, and its music isn't as loud and obnoxious as some of the Fisher Price options. It also has easily adjustable height so you can lift it up slightly as your baby grows taller, and small tray area where you can place some finger foods like Cheerios or puffs. This Baby Einstein activity saucer and jumper is good for babies from 4 months until they are walking/climbing; if your baby seems to be getting close to climbing out, then we don't suggest using an activity center anymore! Limitations? Parents report that it's not quite as bouncy as some other options, and that the seat opening can be a bit wide, which can cause some babies with lower core strength to flop forward/backward a bit; to solve this, some parents (like us!) place a folded blanket or small pillow in front to help the baby's posture. 6. 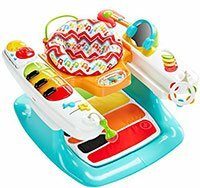 Fisher Price 4in1 Step 'n Play Piano. About $100. We got our hands on this Fisher Price 4-in-1 Step and Play Piano activity center in mid-2018, and we fell in love! It's a super versatile activity center that converts into 4 different modes. First, it has a tummy time piano play mat that can be placed right on the floor for some inspiring tummy time! Second, the exersaucer part of it has a spinning seat for all-around play. Third, it has a stationary walker built into it, with the seat sliding forward and back on rails so the baby can learn cause-and-effect while practicing their first steps. Finally, when your baby becomes a toddler it can turn into a cute little activity table. There's a lot of versatility here. When we got it, we were interested in the concept but also concerned about a couple things - first we were concerned that it was just too much electronics and noise for a young baby, and second, we were concerned about fingers getting pinched on the stationary walker rails. But after a few hours of testing, we were pleasantly surprised. The pianos (the one for the feet, and the separate one for the hands) was reasonably quiet. And the sliding rail for walking forward and back was actually pretty stiff and slow making finger pinching less of an issue than we thought. So, we were off to a good start, and our two test babies (one 4 months, one 6 months) really loved it. The height was perfect for both of them, the toys provided tons of entertainment and learning (they loved the little mirror! ), and we thought that overall it was well thought-out and constructed. Will it team musical talent? Probably not, but it was definitely a fun concept! And the little musical notes that click when you slide them were a nice touch as well. Cons? Well, it goes through batteries quickly, it's bulky and does not provide easy storage, and it's a bit expensive relative to other options. But if you're looking to make a little music, this is a great option! 7. Bright Starts Around We Go Activity Center. About $80. We love the concept here. 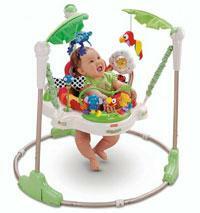 Rather than jumping up and down, babies using this activity center run around in circles like a dog chasing its tail! Our test babies loved it once they figured out how to get it to move around. It was fun to watch, and see babies learn how to go spin around toward the toy they want to play with. While your baby is small, it's a great activity center with a unique design. When they grow out of it, you can detach the seat and use it as an activity play table, which is a great concept. We know of only one other highly-rated activity center that can convert into a play table; the Oribel PortaPlay converts into a small arts and crafts table by removing the toys and putting on an included cover. Really cute, works very well, but a bit more expensive at around $120-130 (or $150 when you buy it with the chairs). Back to the Around We Go - we also found that while a baby was in the seat, older kids could walk up to the play center and do some parallel play with the baby, which was nice to see. It includes a lot of cute and fun toys, like a little piano, book pages to flip, and spinning rattles. Nothing too loud or annoying. And there's a little snack tray and cup holder that can fit most baby bottles right into it, which is really unique for an exersaucer and frankly a great idea. Only a couple downfalls here. First, its design makes it take up quite a bit of room in the house. Second, as baby spins around the center, we also found that the entire thing can shift/slide across the floor a tiny bit - if you put it on a good foam play mat this wasn't an issue. Also, some of the toys don't stay well attached and fall off when moved. Other than that, we think this is a really unique concept and think it's a great option! 8. Evenflo Triple Fun Active Learning Center. About $100. This is an awesome new addition to our activity center list. 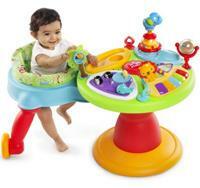 Rather than only being an exersaucer (as pictured to the left), it also can serve as a playmat and activity table. For newborns (0-4 months), the playmat is awesome for laying your baby down on the mat and letting them reach up to cute toys dangling above. Also, a great opportunity to practice rolling and pushing up with their arms. 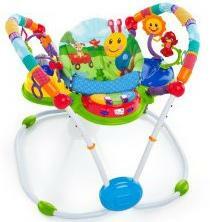 After about 4 months, the exersaucer is a great entertaining option with several toys and music. We liked that the exersaucer has height adjustment so even the littlest of legs can reach the base. And the music wasn't excessively annoying like some other options. Finally, once your baby is of walking age (around 12 months), it converts into an activity table that's great for one or toddlers to play with. So, this is definitely the most versatile option on our list, growing with your baby from newborn to toddler. In our tests, we thought the exersaucer configuration was definitely the best and most useful, though it's not very dynamic (doesn't really bounce or rock, just the seat spins to change direction). The playmat was a bit simple, not quite as plush as other options on the market, and doesn't integrate any tummy time supports; so, we'd give the playmat about a 3 out of 5. The activity table is a great concept, but we didn't think it was very stable and our toddlers pushed it over a few times; so, we'd give the activity table about a 3 out of 5. Overall, we think this is a great 4th option if you're looking for versatility that will last several years. As always, there's a trade-off between versatility and just how great any single configuration is. About $60. Simpler, lighter weight, but still well-constructed and fun. Height adjustable, spinning seat, and a unique jumping mechanism with a bungee-loaded foot platform rather than a bouncing seat itself. So the baby gets some springy input, but without the dramatic and perhaps overwhelming physical and sensory experience of jumping like a lunatic, listening to loud music, and watching bright colors. 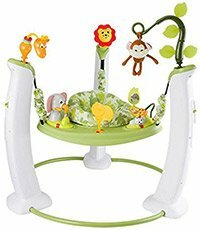 This Bright Starts Sweet Safari Bouncearound Activity Center has none of that, and we think that's a good thing for some babies. We're somewhat biased towards the relatively subtle activity centers, however, believing that lower sensory input might be a good choice for many babies who need a relatively calming environment. And, it's cheaper than half the price of any other options on our list, so that's definitely a good selling point. It's cheaper but also simpler, however, and some parents report that it's not really bouncy like any of the other options. So if you're looking for a wild jumpy ride, this is not the activity center for you! It is also quite a bit smaller than the other options on this list, with a small footprint. This makes it a bit limited in terms of play and stability, but also more compact and easier to collapse and store away. Final thoughts: Toys, fun, bouncing, spinning, engaging and interactive games, all while keeping your baby stationary in a location? Could it be? Parents love activity centers and exersaucers for many reasons. First, they are the perfect and relatively portable place to put your baby while you need to do something and guarantee your baby isn't moving. Need to shower? Get dressed? Take out the garbage? Do some cooking? Activity saucers are perfect for this. Second, the good activity centers are truly engaging for your child, combining several whole-body activities that combine multiple senses in play. This makes it not only an exersaucer but also a learning center that can promote sensory-motor and cognitive development. For instance, the baby can bounce, walk/spin around, use their hands to manipulate little toys, and learn cause-and-effect relationships. There's also a little secret for parents who know their baby needs to poop but might be a bit constipated: activity centers are one of the best "homeopathic" laxatives! We also want to point out that research shows that babies who use these activity centers, bouncers, and exersaucers, show no difference in motor development relative to babies who do not. So while there's no cause for concern with using these, there's also no cause to believe that it will benefit your baby in any particular way. Don't expect benefits to gross motor skills, fine motor skills, or anything else in particular. A good activity center tends to be around $100 - but you'll get a lot of use out of it, and likely will be able to sell it and get some money back after a year of use (think Craigslist!). Questions? Remember you can always reach out to us on Facebook!